Whether you’re travelling with your sibling, significant other or your whole family, Singapore’s diverse and dynamic landscape is ideal for a weekend away. Read on for our best picks for 48 hours in Singapore, including tips on where to eat and what to see and do. Check in to the iconic Marina Bay Sands. With an infinity pool, observation deck and insane views over Marina Bay, how could you go wrong? Or, if you’re a sucker for great design, check out the newly opened Warehouse Hotel. The boutique hotel was built in 1895 and has been lovingly updated to modern times, while maintaining its heritage vibe. Refuel with some of Singapore’s famous street food in the colourful Malay Quarter’s Haji Lane. The district’s vibrant murals provide a great backdrop to photos and the area is littered with great food and bars, plus awesome music! Flytographer Kelly suggests trying roti prata, spiced ginger tea and kebabs! Treat yourself and unwind from your flight with massages at the Banyan Tree Spa at Marina Bay Sands. Try the Signature Master Therapist Experience, a 90-minute massage treatment tailored to your individual needs. Then, head to the Jubilee Bridge and enjoy Singapore’s skyline – and perhaps the sunset reflecting off the Marina Bay Sands Hotel building. From there, you can see Singapore’s famous Merlion spouting water into the bay area and historic bumboats travelling through the water. Enjoy the rest of the evening walking around the bay towards the Helix Bridge and the unique ArtScience Museum building and end with a nightcap at Bazin Bistro & Bar or RISE Lounge. Friday was for lounging, relaxing and dining, but Saturday is for seeing Singapore’s iconic sights! The most affordable and authentic way to dine is at one of the many hawker street stalls throughout the city. Start at Maxwell Food Centre, a favourite hub for locals and tourists alike. Here, you’ll be greeted by seemingly endless choices at very reasonable prices. For a classic favourite, try Tian Tian Hainanese Chicken Rice at Stalls 10 & 11. And if you’re not sure what to try next, try following the crowds. Next, head to Gardens by the Bay, conceptualized as a city in a garden. The tree-like vertical gardens of Supertree Grove provide shade during the day and a light and sound show at night. Walk the OCBC Skyway, an aerial walkway, to see the magnificent supertrees up close and to experience stunning views of the Marina Bay skyline. Embrace your inner child with a trip in Singapore’s cable car to Universal Studios Singapore on Sentosa Island. The theme park’s seven distinctly themed zones will transport you to various times and places, such as Hollywood, New York, Ancient Egypt and the future. Next up, more local food in the Tiong Bahru district. Upbeat cafés amidst old market stalls, charming art galleries and curio stores make this a great place to spend an idyllic afternoon. Check out the Tiong Bahru Bakery for fresh breads, the Singapura Club for great nasi lemak and satay, as well as Flytographer Kelly’s favourite independent bookstore, BooksActually. After dinner, head to 1-Altitude, the highest al fresco bar in the world, for cocktails. 360-degree views, refreshing cocktails and live music will keep the party going until the wee hours. Do Sunday brunch right with the Vintage Champagne Brunch at Colony at the Ritz-Carlton. Unlimited upscale offerings include fresh crab, lobster, oysters, sushi and sashimi, and a salad bar, as well as more traditional brunch offerings. Plus, did we mention the unlimited vintage Moët & Chandon? After brunch, it’s time to check out the mind-blowing Future World exhibit at the ArtScience Museum. The exhibit expertly interlaces art and science in a collection of interactive installations. Admission times are set to ensure the best experience for all visitors. As for the rest of your Sunday? 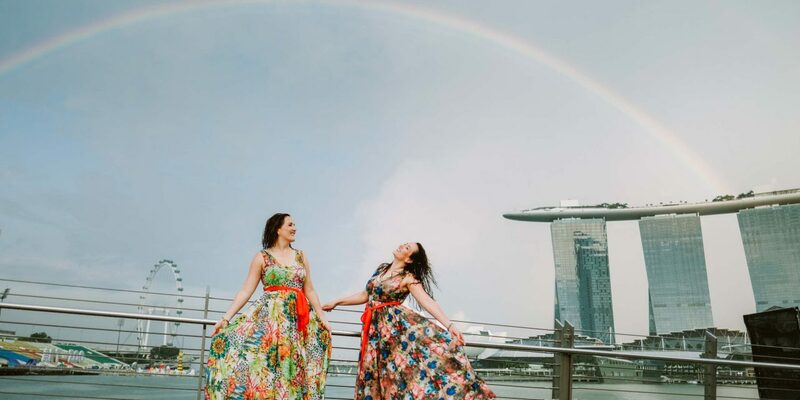 Relax and enjoy the sights and sounds of Singapore before heading home, and perhaps schedule your own Flytographer shoot to capture the magic!